Aprilia never saw fit to sell the Futura with a top box, and this could have been for several reasons. Firstly, they don’t look right because of the high pillion seat, and secondly, because of the high seat, any weight placed in a top box is likely to adversely effect the handling of the bike and even induce high speed weave. In their accessory catalogue Aprilia only ever sold a roll bag to be tied to the pillion grab handles. 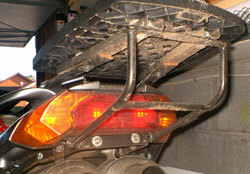 However, if you must fit a rack to the rear of your Futura, there’s only one off the shelf option, made by Hepco-Becker. 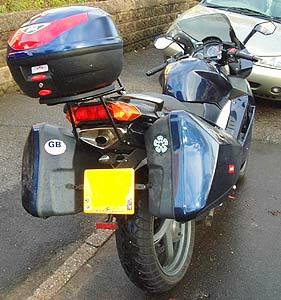 Givi also make a plate for a top box, butyou’ll need to go the DIY route for a rack. Both Hepco-Becker and Givi make cases to fit their racks. Northern Phil’s (aka Philtura) home made rack leaves plenty of room for his Quill endcans and comes on and off the bike with ease. He drew up his own design, bought the metal he needed (and Hammerite paint) from B&Q, marked up the metal with chalk and took it to a local fabrication company. Total cost: £20 – a tenner for the metal and a tenner for the welding. There are some more pics here.